I keep telling myself to resist the corn at the farmer’s market because it’s SO not corn season anymore…but it’s at the FARMER’S MARKET. Who am I to argue with nature? This sounds so good with the coconut milk and tarragon. Mwah! love. I make my corn chowder with coconut milk too. So good! And I hope I can find some corn still at the markets, because I’m missing it just a little bit. I made this last night for dinner, and it was DELICIOUS! The perfect fall soup for a chilly, rainy day. Thanks for the great recipe! Looks like a bowl of heaven- it’s 42 degrees here right now and I can’t stop thinking about soup! I’ll be dreaming about this one! I love following your blog- come over and visit anytime! Your soup sounds lovely! There’s a smattering of snow on the ground (already?! ), so nothing sounds better than soup right now. Last winter my favorite soup was a butternut-squash corn chowder, this may give it a run for it’s money. Do you think frozen corn would make an adequate replacement for fresh? when i saw this post, i knew this soup would be in my very near future. i made it last night and it was to die for. my three girls devoured it (they are 8,6, and 3) and my husband said he could eat it every night! for the person who asked if frozen corn would work, i used half fresh and half frozen corn because i didn’t have enough. it worked great, but i did microwave the frozen corn that was going in the blender so it would puree better. i doubled the recipe because i could tell it was a soup i’d want a ton of leftovers of and i was SO right. i couldn’t wait to have a big bowl for lunch today. another winner by dana! thank you! i will definitely be reposting on my blog! 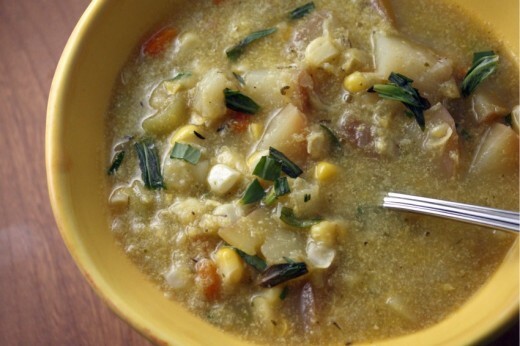 Yumm I love all forms of corn chowder and your version looks delicious! Is there a sub for coconut milk that would work well in this recipe?